You know the part in Westerns where a bad guy gallops off with some widow's or orphan's horse, so the roguish anti-hero tears after him on his own stallion, and when he catches up to him the two battle it out stride by stride until the anti-hero finally shoots the bad guy off and thus has to corral the two horses by straddling them? Bull skating, or Karapan Sapi, is kind of like that, but with bulls. 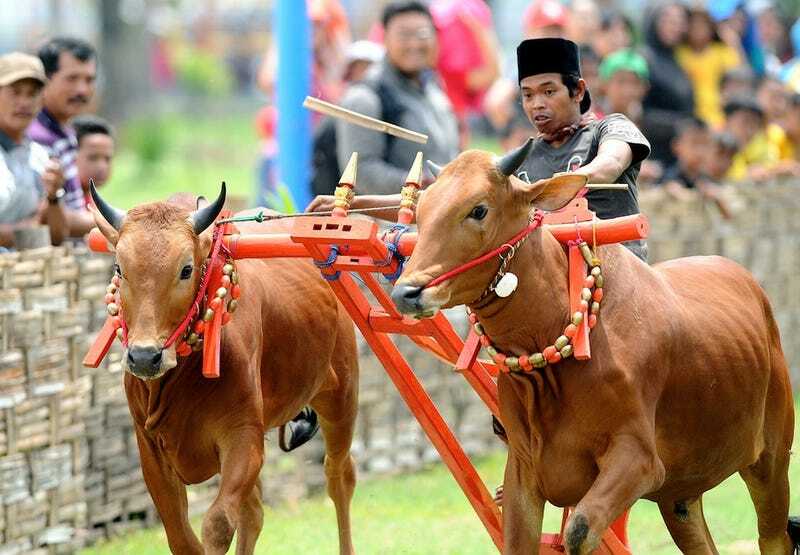 Essentially an Indonesian rodeo event, the Karapan Sapi race involves latching together two bulls with a decorative wooden harness that also has a place for a rider to stand. The rider gets up in the saddle, whips the bulls a few times, and hangs on for dear life. Afterwards, the bulls are auctioned off, presumably to rich guys who want to practice the sport themselves. The best part is the crowd's reaction. They respond to the ridiculous awesomeness on display with the right blend of disbelief, confusion, and unbridled joy. Check out the whole Modern Farmer article for more pictures and information. You've been put on notice, mutton bustin'. There's a new challenger seeking to be the greatest human-animal rodeo competition.